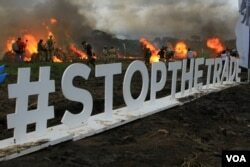 Plumes of smoke filled the air of a muddy Nairobi National Park as Kenya’s President Kenyatta presided Saturday over the burning of 105 tons of elephant ivory and 1.35 tons of rhino horns to send a message to the world that ivory is worth more on an elephant than it is in the market. The torching of this stockpile made it the largest ivory burn in history. The event marked Kenya’s commitment to stopping the poaching epidemic, which has resulted in tens of thousands of elephants across the continent being killed every year for their ivory tusks. In total, the ivory at the burn represented tusks from an estimated 8,500 elephants, a Kenya Wildlife Service spokesman said. KWS said a significant part of the stockpile came from ivory and rhino horn captured from poachers or seized in transit. 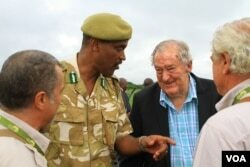 Critics have argued that poor countries like Kenya should sell the ivory to improve the lives of their people. The Kenya Wildlife Service has responded that selling these illegal trophies dramatically increases elephant poaching, threatening the animals' very existence. Living elephants have value, whereas ivory does not, it said. Heather Higginbottom, U.S. deputy secretary of state for management and resources, attended the event and said that saving elephants helps everyone. Poaching has escalated to alarming heights in recent years, as 100,000 African elephants were killed between 2010 and 2012. James Isiche, East Africa regional director of the International Fund for Animal Welfare, said such numbers represent a grave threat to elephants everywhere. Kenya has had success in reducing poaching, from 384 elephants killed in 2012 to 96 killed in 2015. But conservationists say that this progress could quickly be reversed if people don’t remain diligent. But if they do, then Peter Knights, CEO of the wildlife conservation group WildAid, might be right about Kenya’s 2016 ivory burn. “This might be the image that represents the end of the ivory trade," he said. 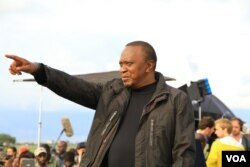 Kenyatta said he would seek a total ban on the ivory trade at the Convention on International Trade in Endangered Species meeting in September.